Every process that happens in the pond is dependent on oxygen. This is especially important at night when plants are not converting CO, into oxygen. Dissolved oxygen levels are also generally lower in warmer water temperatures. 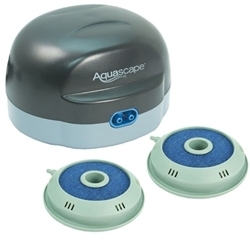 Pond aerators oygenate your pond or aquaponics system, helping all biological processes and creating a more stable environment, resulting in healthier fish and plants. Aeration is also very important during winter months in colder climates, as aeration helps to keep a small hole open in the surface of the pond to aid in degassing. The pump should be placed in an indoor location, which is dry and free from airborne dust and debris. If you notice that your pump is losing air pressure or simply doesn't work as well as when you purchased it, a simple, inexpensive renew kit is available. 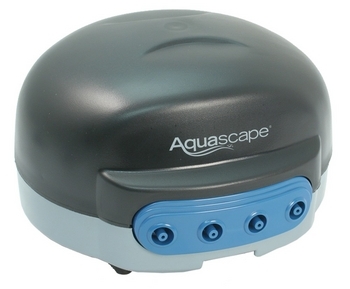 After installing the renew kit your pond air pump should be as good as new. Length of Air Line 2 x 25 ft. Length of Air Line 4 x 25 ft.